Mr Marsh’s favourite flavour of Ben and Jerry’s is Cherry Garcia. The Fro-Yo even more so. And as he was so kind as to get me an icecream maker for Christmas, I thought I would indulge him and give making some a go. Trying to score me some wife points. Today we have been busy bees, putting up pictures, and sorting out boxes ready for storage. (Mr M insists on keeping the original boxes for everything… therefore we have a LOT of boxes). I have the Ben and Jerry’s recipe book, and it gives the recipe for Cherry Garcia Icecream, but I didn’t really use it, other than for inspiration, as I used yogurt instead of milk, eggs, and cream, and dialed the amount of cherries way way up! 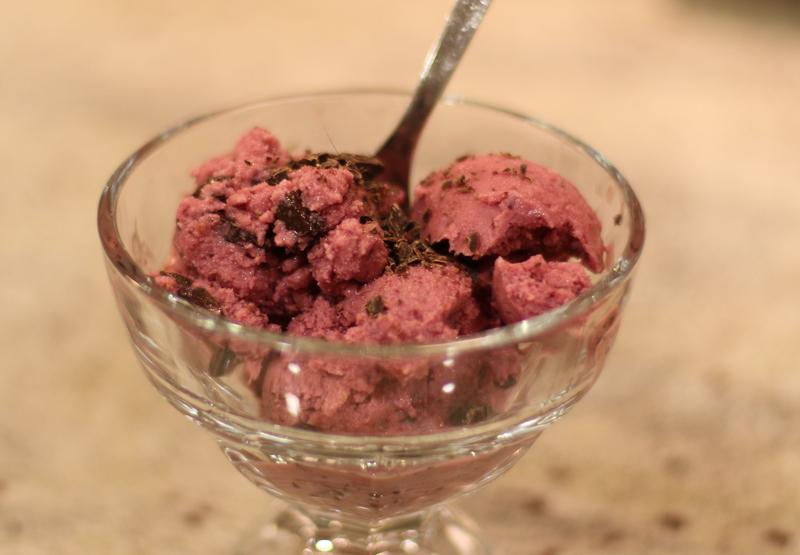 So instead I based it on the recipe for Blueberry Frozen Yogurt from The Perfect Scoop by David Lebovitz. (Yes. I bought another book.) Adapting it by adding in chunks of Valrhona 70%, and fresh cherries, both washed, pitted, and halved for use in the base, and in quarters, to add a little bit of texture to the finished product. Place the halved cherries, yogurt, and sugar in a blender and process until no large chunks of cherry remain, and the ingredients and well combined. Empty the mixture into a bowl and refrigerate for at least an hour. In a separate small bowl, place the quartered cherries and chocolate chunks, and also place in the refrigerator. Add the yogurt mixture to your icecream maker and freeze according to manufacturers instructions, adding the chocolate and cherries, when the mixture has firmed up and is almost ready to come out. Transfer to a freezer-proof container and place in the freezer for a few hours to finish firming up. It is heavy on the cherry, and the yogurt gives it a good dose of tanginess. Mr M’s verdict? Tasty. I’ll take that. Jobs for the week are finishing tidying and sorting, as Mum is coming to visit on Thursday! Our first guests! ← New Year. New Bagel recipe.